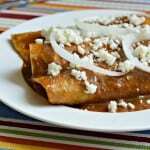 One of the most delicious, unique, and traditional Mexican dishes is without a doubt “el mole” (pronounced “mo-lay”). When I was growing up I lived with my abuelita and she would always make the most delicious mole. I remember that it took all day, but the end result was more than worth it. I would always sit around in the kitchen and try to help her with whatever I could and she, being the patient, loving woman that she was, would always let me contribute in some way or another. While I have tried many different versions of mole, my abuelita’s will always be my favorite! If you think it sounds strange, you might be right, but the flavors are so awesome and you can use it to make delicious enchiladas or as a salsa for just about any Mexican food. I think that everyone that enjoys Mexican food should try mole at some point – you may be surprised that you really love it! This unique dish is made from a base of dry chiles, chocolate, and spices which give it an amazing flavor. There are many different versions and it is often prepared to celebrate birthdays and other special occasions. This dish is definitely full of flavor, but it goes without saying that making it from scratch is very complex and it requires a lot of time! Fortunately, many food manufacturers have begun to create a pre-made version of the famous mole. Clearly, the flavor of the pre-made versions is definitely not the same as the made from scratch version, so for this recipe, I am going to show you a simple way to improve the flavor of the pre-made version so that you can get a more “made-from-scratch” flavor. Mole can be served in many ways. 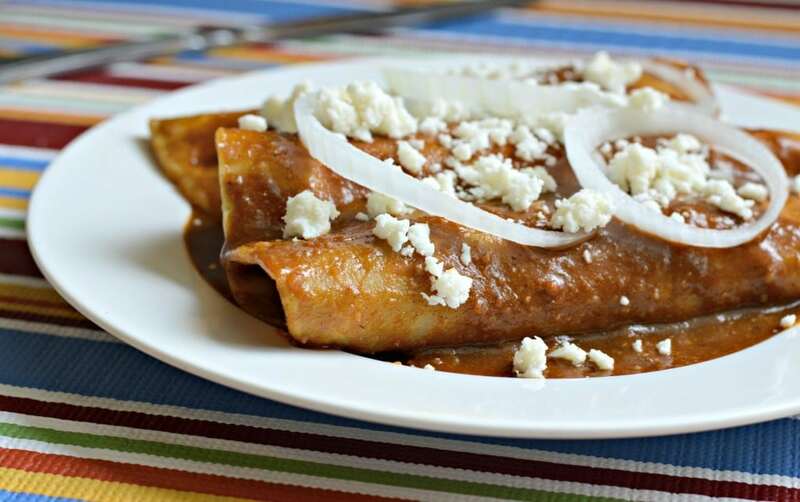 Traditionally it is served with chicken, but it is also very delicious as an enchilada sauce, and that is the presentation that I am going to show you today. This is probably one of my husband’s favorite Mexican foods, and when I made it for my sister-in-law the other day, she said it was one of the best things she has ever tried. Hopefully that is enough to convince you to give this a shot – and don’t forget to let me know how it turns out in the comments below. tortillas sliced onions and cheese. 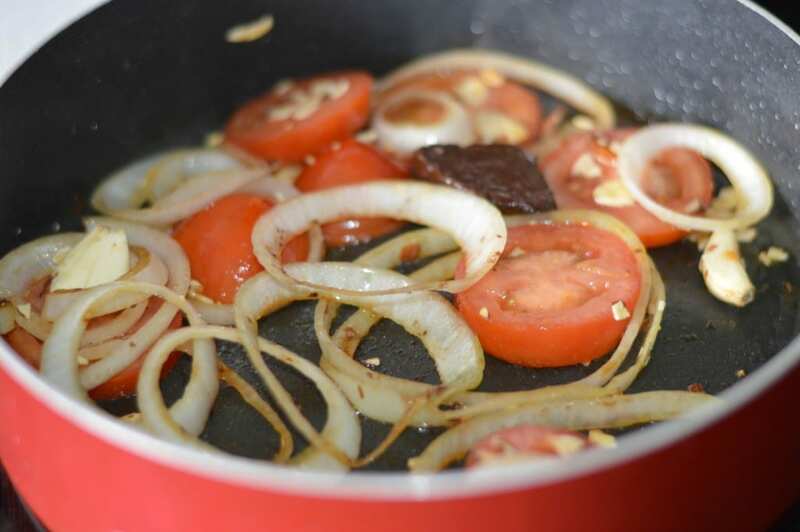 Lightly fry the bread, tortilla, and banana in a frying pan with a small amount of oil. 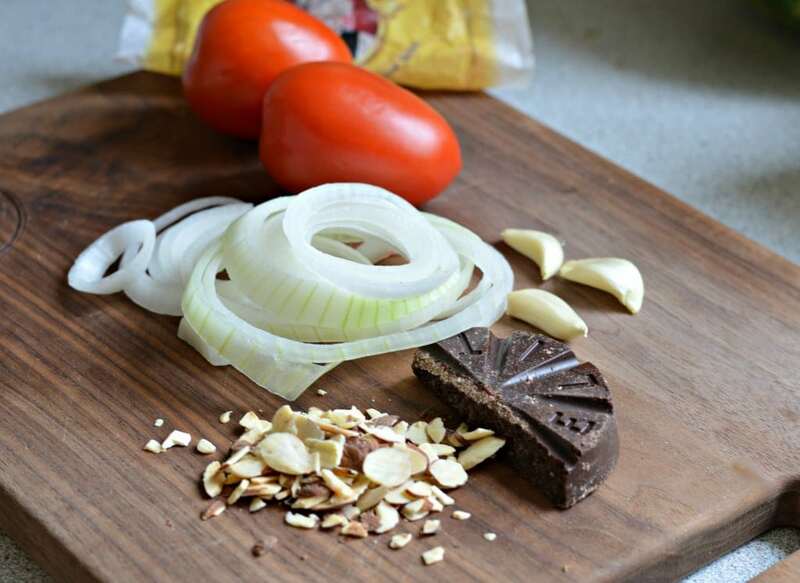 Once lightly fried, set aside and in the same pan saute/toast the onion, the chocolate, the almonds, the tomato, and the garlic cloves. 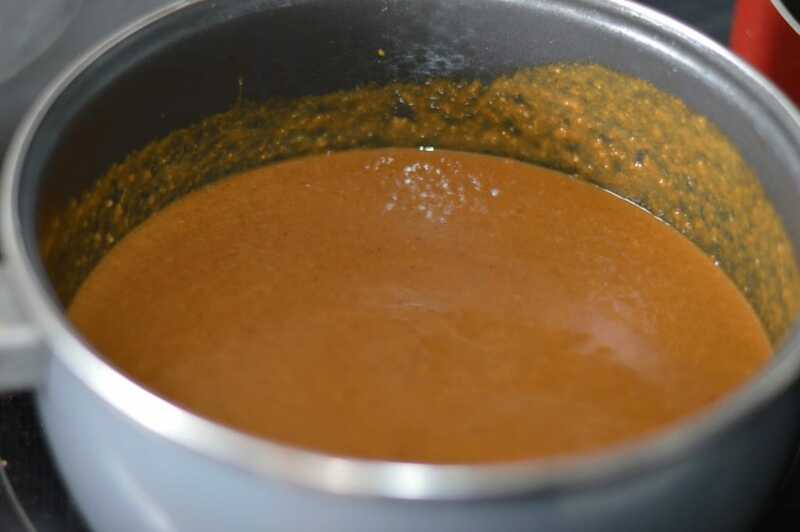 Add everything to a blender with the chicken stock, the contents of the box of mole, and the chicken bouillon, and blend until everything is in liquid form. Add to a large covered pot and bring to a boil before lowering heat and allowing to simmer. Season with the sugar, pepper, and cumin to taste. 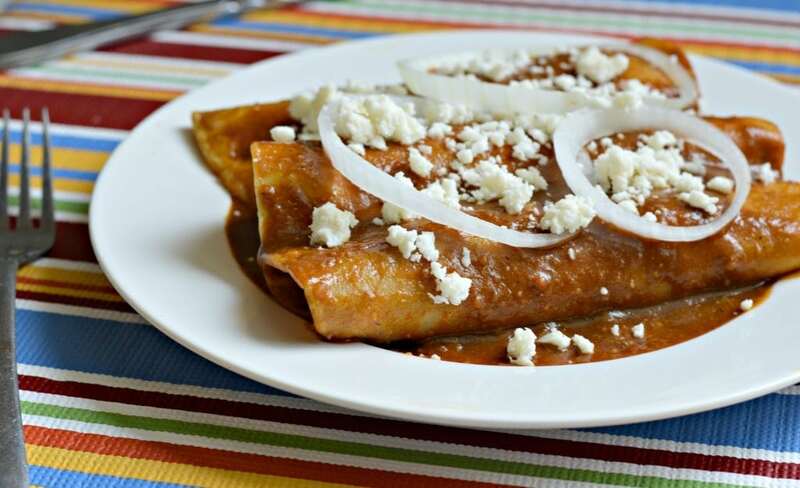 Form the enchiladas by covering the lightly fried corn tortillas in the mole, then add the chicken or beef filling, roll up and top with cheese and onions (sauteed or raw). I will disclaim that I am Caucasian and did not grow up eating home-made mole BUT I do live in Southern California and am surrounded by some mighty fine, authentic Mexican food. It only calls for 1 cup of broth . We don’t need to add water? Hi Julia – for this version, which uses a store-bought mole as a base, you shouldn’t need to add any water. 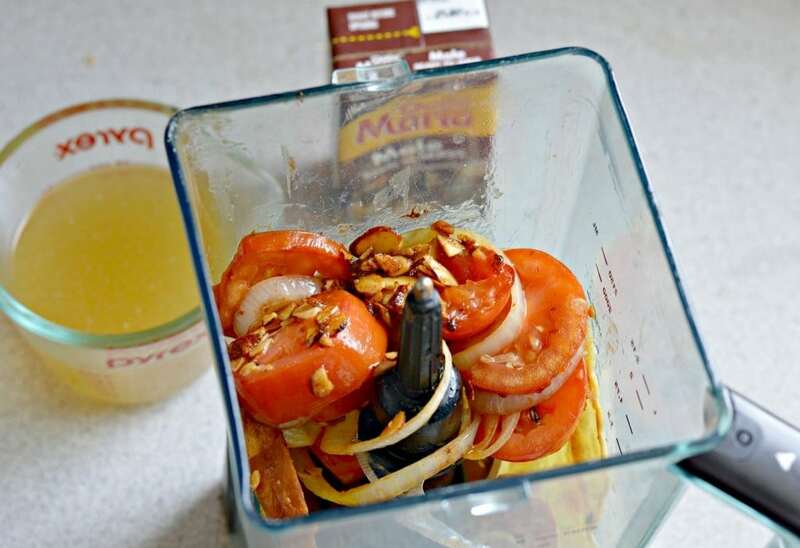 If it seems too thick after you blend everything together, you can add a little bit of water or additional chicken broth to thin it out, but I have never had an issue. Let me know if you have any other questions. Thanks! It came out great! We did add some more broth to thin it out more. Will make again. Thanks! Hi! I am looking for a recipe for a beef mole. I have made poultry-based moles and enjoy the process. My question is: How would you alter the recipe, if you were to eliminate the box of mole?